I was browsing through the Triunfo website today and noticed something very different about the website. The layout and products have totally changed since last year. The first thing I noticed was the fact that Triunfo is now selling other brands of pointe shoes besides their own. I was very disappointed by this! 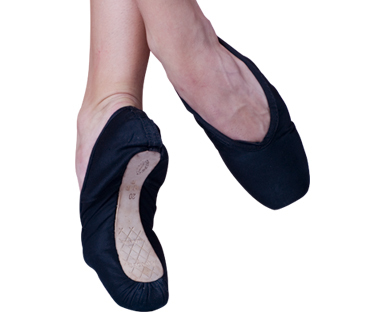 One of the most attractive qualities of a European pointe shoe website is looking at brands that are unique to that company. This is another manufacturer that has succumbed to the pointe shoe globalization bug. Why do pointe shoe manufacturers sell other brands on top of their own? I can only guess that it’s a business move. Maybe the dancers that come in for fittings want hundreds of choices. Maybe it’s more profitable to sell other brands at a commission, I don’t know. It was still a shock to see Gaynor Minden and Grishkos on Triunfo’s inventory. If every pointe shoe manufacturer did this, think how confusing buying pointe shoes would be. Can you imagine Repetto selling Suffolk pointe shoes or Russian Pointe offering Capezio’s? I will miss the fact that Triunfo used to be a 100% Italian pointe shoe website. I haven’t visited the Triunfo website since last year. I was pleasantly surprised to find a shoe here that wasn’t on the site last year. This is the Spartacus model and it is strictly a man’s pointe shoe. This shoe is described as a strong model created to withstand higher thresholds of pressure and weight. They only come in black and they have 3/4 shanks with hand-stitched soles. This entry was posted in Italian Brands and tagged Pointe Shoe Brands, pointe shoes for men, pointe shoes made in Italy, Triunfo pointe shoe, Triunfo Spartacus. Bookmark the permalink. for first thing i want give You my congratulation for your website. We have manufacturing, distribuctions and stores. The factory and the distribuction sell only Triunfo products and in the company band website http://www.triunfodance.com , You can find only our products. In the Triunfo stores website, You can find all the brand, and I will explain You: we want, and we need to give the choice to the dancers. We are happy when people buy our shoes but we are more happy when dancers choice in a range of more of 160 styles from all the world. We can study in our stores, we can making comparations, we can improove or producs. I hope to keep out Your sadnedd about our brand. Thank You very much for your interesting in our company. When I wrote this post, I didn’t realize that Triunfo has 2 websites. I do apologize. I want to clear that up with my readers. I am very happy to know that Triunfo.com still has the bella scarpe de punta 100% Italiana ! I have a pointe shoes this model. I can not give your email address to send some pictures? Feel free to leave a link to your photos if you use Flickr.com or some other image hosting website. I look forward to seeing them. Do not have an account on Flickr, but this weekend I will take pictures and then send the links of these photographs.